Improve your health and quality of life through balanced eating! Healthy Eating Every Day is a practical, evidence-based program that teaches you how to improve your eating habits in ways that fit your lifestyle. Inside, you'll discover how to choose the right balance of the right foods, set realistic goals and rewards, and cope with triggers for unhealthy eating. You'll also learn these useful skills: - Create food shopping lists that include healthy foods - Balance calories to achieve and maintain a healthy weight - Eat well when dining out or away from home - Set personal goals to help you reduce your sodium intake or increase the number of fruits and vegetables you eat Healthy Eating Every Day contains checklists, charts, activities, and reminders to help you personalize the program and enjoy the process of learning how to eat healthy. 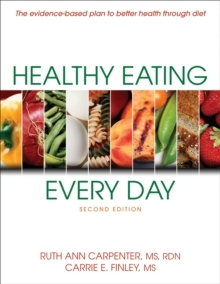 Newly updated with the most recent version of the national dietary guidelines and the latest nutrition science, Healthy Eating Every Day gives you the resources and confidence you need to improve your health by eating right.